An independent survey by the Vilnius-based institute NISEPI, exposes that Lukashenka's "victory" in the 19 March Belarus presidential elections may have been exaggerated by some 20%, RFE/RL reports on Friday. According to the figures given by the Belarus Central Election Commission on March 20, some 83% of votes had been in favour of the incumbent president Lukashenka. Indeed, hardly had polling stations closed on Sunday 19 March before the Commission chairman proclaimed Lukashenka's victory. Few think that the real figures ever will be exposed and irregularities have probably already made all results indecipherable. Therefore, as Vilnius-based Independent Institute of Socioeconomic and Political Studies (NISEPI) earlier this week publicized a survey among nearly 1,500 adult Belarusians from March 27 to April 6, an alternative perspective was given. According to these figures, Lukashenka would have received some 63.6% of votes among those involved in the survey. Thus, it seems that Lukashenka's victory of 83% was inflated by almost 20% of the electorate. Also, the poll indicates that the opposition presidential candidate, Alyaksandr Milinkevich, may have been deprived of nearly a million votes, while he received nearly 21% of votes in the poll as compared to the 6% of the official results. As much as this would give the opposition much stronger public support than expected, NISEPI Director Aleh Manayeu is fast to point out that this should not be equated with a strong opposition movement. Votes are votes and the public display of it by political action is another thing. 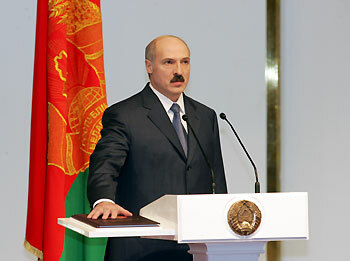 NISEPI, which conducted the survey, was closed down by the Supreme Court of Belarus in April 2005, having made a survey that disqualified the results of the October 2004 constitutional referendum, suggesting that Lukashenka actually lost it. Since then, the institute has relocated to Lithuanian capital Vilnius, which today forms a centre of the emigré Belarus research community.